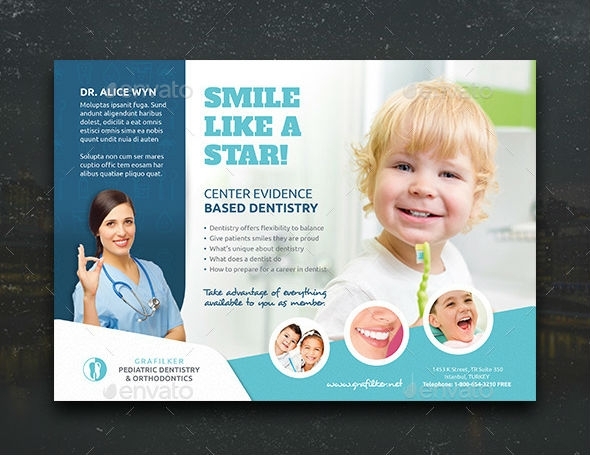 Medical flyers offer a one-way communication towards their target audience and the medical brand itself as well as a visual representation of a such. 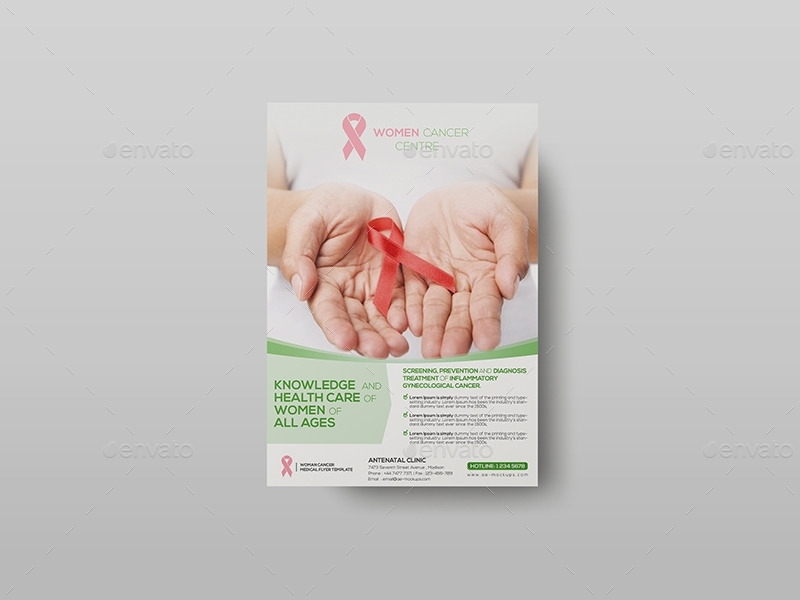 One way of effectively showcasing medical products and services is through the use of promotional materials such as flyers. To help you get by in designing, you may skim through our list of medical flyers for utilization as well as for design reference. 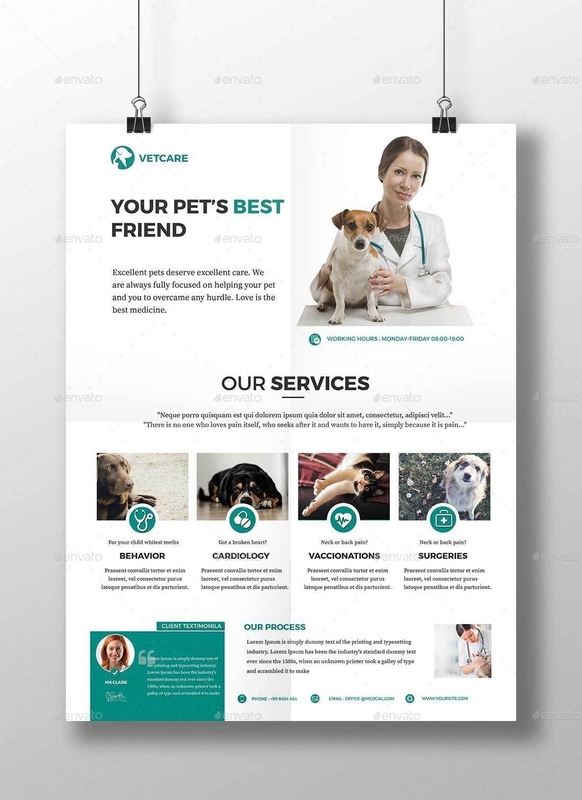 We have gathered and curated designs that are demonstrated with appropriate layout for clear messaging as well as with crisp and clean colors that best represents a medical brand. You may also go through our list of health brochures available in a PSD format that will be of great use for design projects, design presentations and for future utilization. Medical flyers don’t need much of experimentation when it comes to design but great composition and layout is key in designing medical flyers. 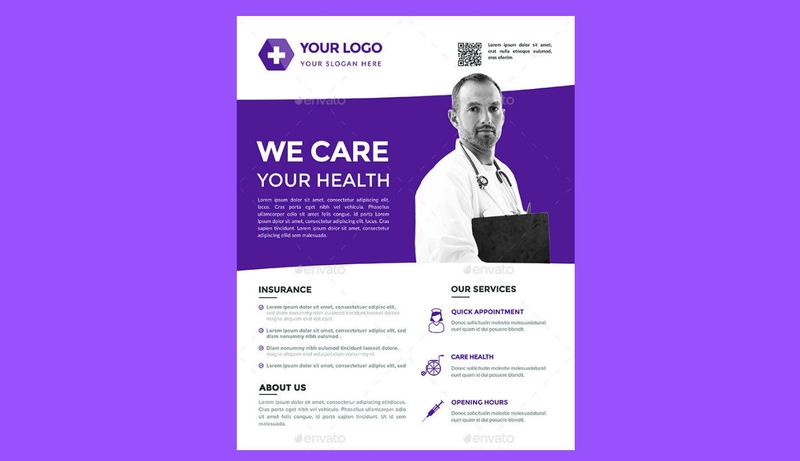 With a handful of important information and details regarding the medical brand and its services, you have to place each blocks of elements in a way that is professional and organized to create a cohesive and appealing set of medical flyers. With that said, medical flyers demonstrates a simple design added with informative details on what their target market needs. 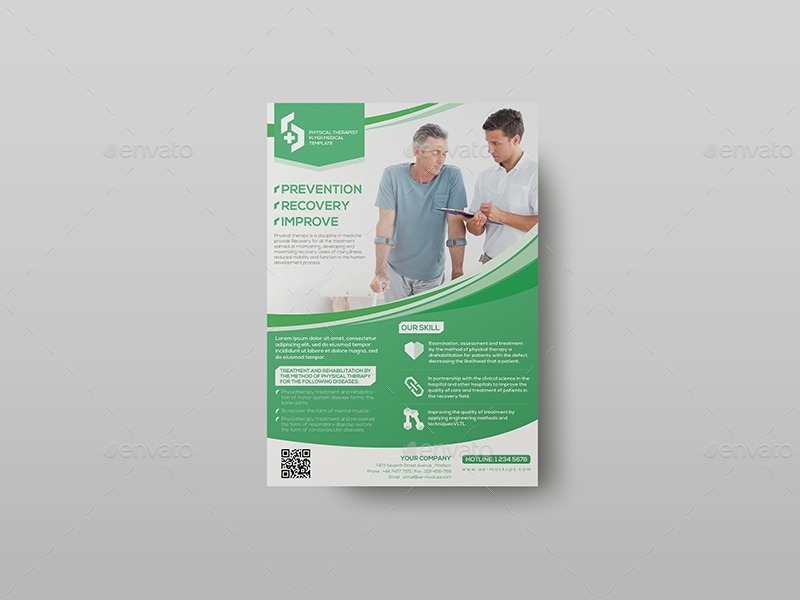 If you have trouble crafting medical flyers, you may utilize this heap of medical flyers as a design reference. Also, you may freely download our samples directly below. An Assortment of Medical Flyers. 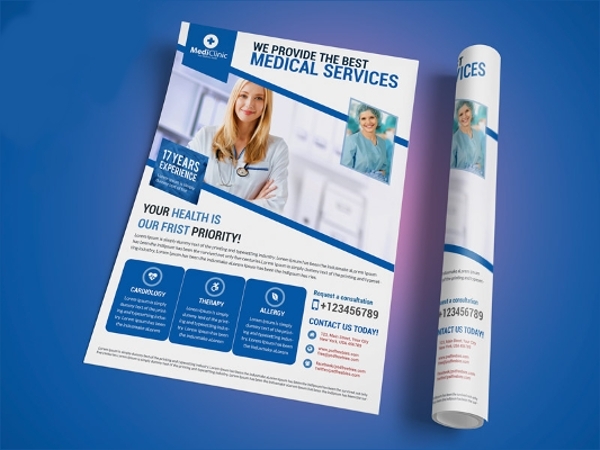 When it comes to medical flyers, you have to mindful of your target audience or simply put, the people who would most likely read and need your flyer. With this design, it uses a two column layout distributing the technical elements side by side. Thus, giving hierarchy with the block of texts and an organized direction as to where to read. Readers will have a breeze in skimming through the content most especially the call to action such as website, contact information, and address. Which is visible and placed on a quiet background on top and beside the logo for the easy imprint of the medical product or service being presented onto the medical medium. The beauty of this medical flyer is the layout used in separating and distributing the categories accordingly. The viewers are given a direction as to the parts to read first and then connects to the other segments. The bottom line, this specific flyer design is laid out in an organized way. Even with its equal use of text and images, the touch of graphics makes it easy for visual imprint towards the content as well as adding the brand’s color to bring in more personality. 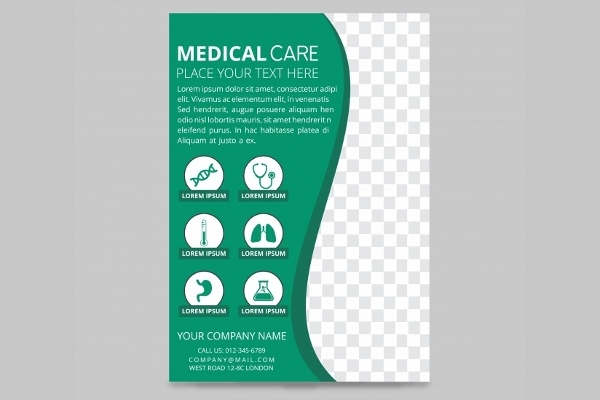 Using shapes for the medical flyer design allows distribution of technical elements and placement of the images used. With the use of curved shapes enhance this sense of movement and best connotes comfort and energy. As well as the use of shades of blue brings about a trustworthy impression; a strategy most used in medical brands. 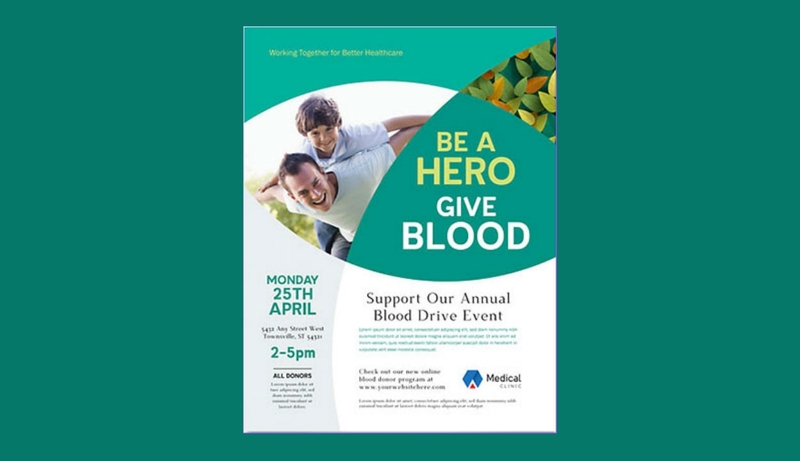 This specific medical flyer design utilizes a picture window layout wherein the use of images is the dominant element in the design with sufficient space for the text. One feature that seems to apply repetition is the pink ribbon symbol. It is a prominent feature since this increases the exposure of the brand and the cancer symbol for visual imprint. Another great example of utilizing a picture window layout. This time, it has minimal text and a much more dominating use of the image. The brand’s color is set across all the design examples as well as with their design and typographical elements. Also, to note that the images used focuses on results of the medical service. On the photographic side, the images used displays a natural take on its shots; not overly processed and centers on customers. The use of the image best represents the service of the brand that is being offered as well as the brand’s message. The dominant use of green for its design elements connotes safety, fertility and best associates the color of life. On the design side, this specific medical flyer comes in three design variations all of which are 100% customizable. You may freely resize the design with no quality loss as well as the objects are removable and editable. More importantly, it is set in a 300dpi format and is CMYK print ready. This specific medical flyer incorporates the Mondrian layout which applies proportions through the use of horizontal, diagonal and rectangular shapes. All three of which are the prominent characteristics of this layout format and overall flyer design. The subjects used in the latter connotes a wider reach in its target market and varying services offered. If you are looking for a design that allows a sufficient space for information and details, then look no further. 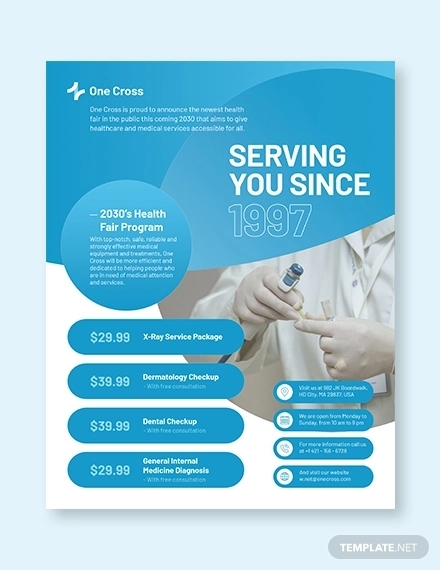 The Physical Therapist – Flyer Medical Template offers a Creative flyer design that incorporates a picture window layout for both images and text to be applied. As well as equal distribution of technical elements. Aside from its overall design, on the technical side, this specific flyer includes three design variations and are fully customizable. The objects are resizable with a not loss in its quality as well as it’s removable and editable. It is also set in a CMYK print ready and high-resolution format. Another medical flyer design that incorporates the Mondrian type of layout. As well as the use of shades of blue which gives off a calming effect and the association of trust and confidence for the brand it is to present. The transparent overlay allows more space for the copy and using the type of layout to its potential. 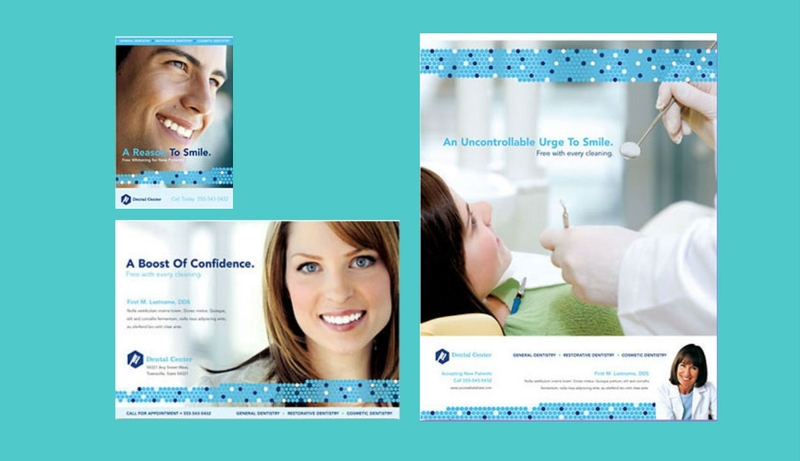 As presented above, this specific medical flyer design offers three design variations. You may freely choose what page size you want to utilize be it 8.5×11, 1/2 page and 1/4 page. The flyer designs offer not folds in their design and in terms of file formats, you may utilize the following Adobe InDesign, Illustrator, Microsoft Word and so on. With the type of subject it used for its image, the medical flyer design is dedicated for adults; let us say who are parents. It does allow sufficient amount of information placed on the flyer design as well as demonstrate a visual fitting for children. 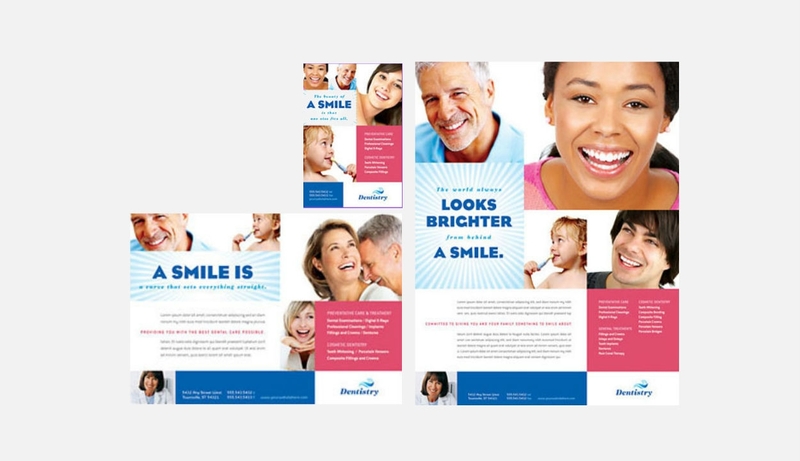 The Kid’s Dental Flyer Design Template is inclusive of a lineup of color variations for an extensive selection. All of which is provided in a downloadable format which you may visit in the provided redirect button directly above. 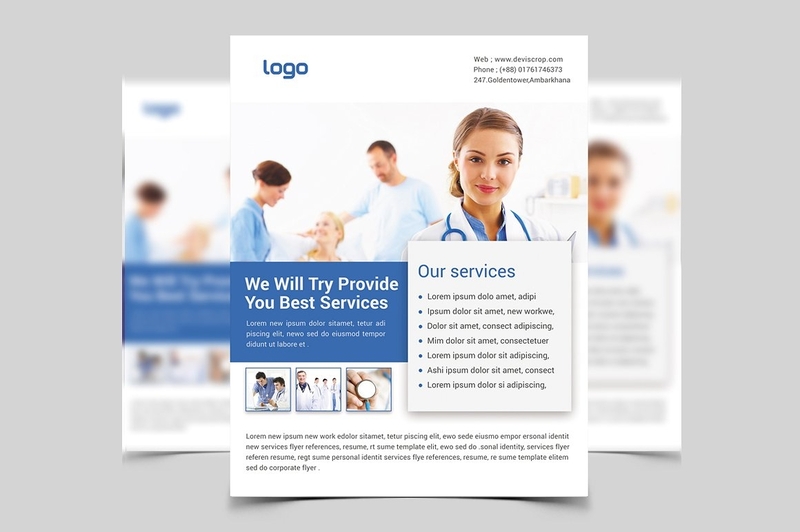 If you are considering a great deal when it comes to medical flyer designs, the Simple Medical Flyers Templates with Pops of Color offers a lineup of features. 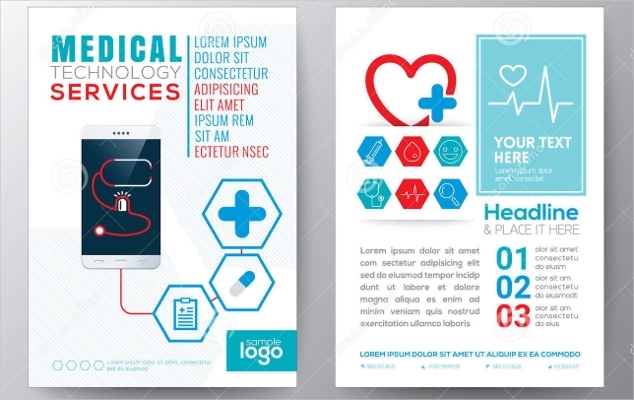 This set of medical flyers comes along with four design variations and you may freely edit the text layers or the color shape layers. It is set in a letter size medium perfect for flyer mediums as well as in a high-resolution 300dpi file format. 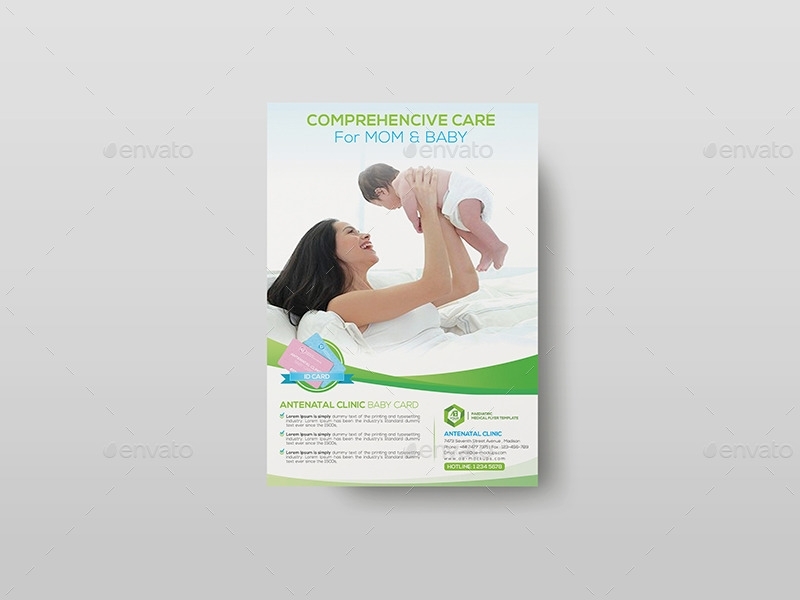 The fonts used in this medical flyer design are as follows: Lato font (link available in the redirected page), Montserrat (OTT) font and Proxima Nova font. As presented directly above, this specific medical flyer designs is inclusive of three color variations for an extensive selection. All of which are available in a downloadable format which will be of great help for your design projects and presentations, design mood boards, reference and more importantly to utilize as advertising collaterals and promotional materials. It is important for a specific target market to be aware of a product or services that they need. With the use of promotional materials, a brand could reach out and expose their message to their specific demographic and potential prospects. The given is the practical side of advertising, and in terms of design, you have to make sure that your flyer design best represents your brand and is inclusive of the important details for the viewer and to your specific target market. This specific medical flyer is one great example to use as a design reference in terms of its concept, copywriting as well as its use of visual communication and design fundamentals. 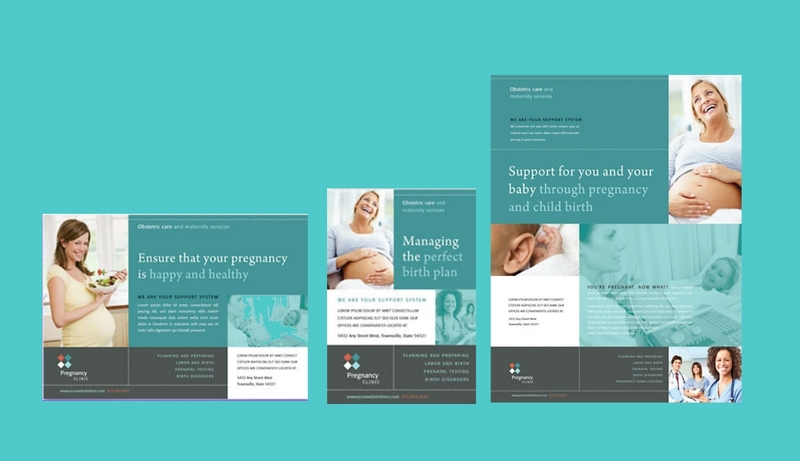 For a more plentiful design options and alternatives, we have gathered a collection of health and medical brochures available in a PSD file format. These samples would be of great help for your design projects and presentations and for future utilization.